The Trimble Ready Hyundai HX220L excavator with the Trimble Earthworks system will perform live outdoor demonstrations at the Trimble Dimensions Offsite Expo. Hyundai Construction Equipment Americas has announced it will showcase a Trimble Ready Hyundai HX220L hydraulic excavator running the Trimble Earthworks Grade Control Platform during the 2018 Trimble Dimensions User Conference, Nov. 5–7 in Las Vegas. A Silver Sponsor at this year's event, Hyundai will host an exhibit at Booth 222 at the Sands Expo and Convention Center at The Venetian. The Trimble Ready Hyundai HX220L excavator with the Trimble Earthworks system will perform live outdoor demonstrations at the Trimble Dimensions Offsite Expo. "Hyundai is pleased to participate as a Silver Sponsor at the 2018 Trimble Dimensions User Conference, and to showcase our HX220L excavator equipped with a Trimble Earthworks grade control system," said Corey Rogers, marketing manager, Hyundai Construction Equipment Americas. 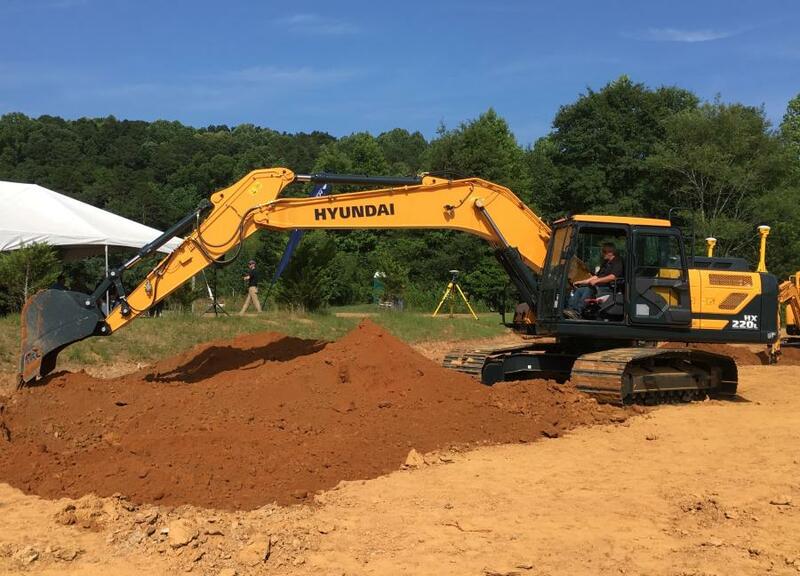 "Our ongoing collaboration with Trimble is a significant example of Hyundai's commitment to helping our customers benefit from using advanced technology solutions." To make it even easier to adopt technology, Hyundai offers a Trimble Ready Option kit that customers can order from their Hyundai dealer with their machine. Select Hyundai excavators are now ready for the installation of the Trimble Earthworks system, which can significantly reduce the cost and complexity of the installation for the contractor. Designed to help the operator do more in less time, the intuitive, easy-to-learn Trimble Earthworks Grade Control Platform features integrated 3D aftermarket grade control automatics for excavators. The operator controls the stick, while the system controls the boom and bucket. "Contractors, operators and other industry professionals who visit the Hyundai HX220L demo at the Offsite Expo will see firsthand how the Trimble Earthworks system, calibrated and tested for Hyundai, lets the excavator work semi-automatically, allowing the operator to consistently create smooth, flat or sloped surfaces more easily, with greater accuracy and in less time," Rogers said. The Hyundai-specific 2D or 3D Trimble Earthworks machine guidance (indicate system) or 3D machine control (automatics system) will soon be available for order through Trimble's SITECH global distribution network. With an operating weight of 51,500 lbs., the Hyundai HX220L hydraulic excavator features a Tier 4 Final-compliant, 173 hp Cummins diesel engine. The machine provides a maximum dig depth of 22 ft., 1 in., and a maximum reach at ground level of 32 ft. 3 in. The IMOD (Intelligent Moving Object Detection) system senses and warns the operator when objects come within 16.5 ft. of the machine. Performance innovations include the IPC (Intelligent Power Control) for computer-aided power optimization based on load demand. The optional AAVM (All-Around Viewing Monitor) system provides a 360-degree virtual operating view, which displays on an 8-in. interactive, adjustable touchscreen cluster monitor with haptic remote control for all major functions, easier operator accessibility and better ergonomics. Additional options on the HX220L include a boom float mode for improved grading control, one-pedal straight travel mode for forward and reverse travel along roads, banks and trenches and fine swing mode for improved load control. Covering 35 acres, the Trimble Dimensions Offsite Expo showcases the latest Trimble technology — augmented reality, emerging technology, fleet solutions, software, machine control and site positioning systems — at work. The expo features more than 50 machines and attachments from a variety of OEMs and suppliers equipped with a full range of Trimble solutions for applications including aggregates, agriculture, drilling, earthmoving, paving and piling. For more information about Hyundai Construction Equipment Americas visit www.hceamericas.com.